For the professor of surgery, see Maurice Ewing (surgeon). William Maurice "Doc" Ewing (May 12, 1906 – May 4, 1974) was an American geophysicist and oceanographer. 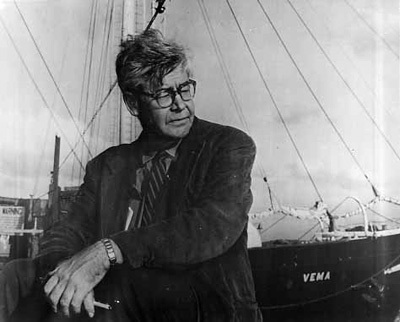 Ewing has been described as a pioneering geophysicist who worked on the research of seismic reflection and refraction in ocean basins, ocean bottom photography, submarine sound transmission (including the SOFAR channel), deep sea coring of the ocean bottom, theory and observation of earthquake surface waves, fluidity of the Earth's core, generation and propagation of microseisms, submarine explosion seismology, marine gravity surveys, bathymetry and sedimentation, natural radioactivity of ocean waters and sediments, study of abyssal plains and submarine canyons. He was born in Lockney, Texas, where he was the eldest surviving child of a large farm family. He won a scholarship to attend Rice University, earning a B.A. with honors in 1926. He completed his graduate studies at the same institution, earning an M.A. in 1927 and being awarded his Ph.D. in 1931. In 1928 he was married to Avarilla Hildenbrand, and the couple had a son. The couple divorced in 1941. Ewing worked as an instructor at the Rice Institute while pursuing his Ph.D. before joining the faculty at Lehigh University in 1930, where he served until 1944. While at Lehigh, he was instrumental in initiating a program in geophysics. In 1944 he married Margaret Sloan Kidder, with whom he would have four children. He moved to Columbia University, becoming a professor of geology in 1947. In 1959 he was named the Higgins Professor of Geology at Columbia. Dr. Ewing (often simply called 'Doc' by those who worked with him) was the founder (established in 1949) and first director of Lamont Geological Observatory (now known as Lamont-Doherty Earth Observatory (LDEO) in Palisades, New York) where he worked with J. Lamar Worzel (gravity specialist), Dr. Frank Press (seismologist), Jack Nafe, Jack Oliver, and geologists and oceanographic cartographers Dr. Bruce Heezen and Marie Tharp. The former LDEO research vessel R/V Maurice Ewing was named in his honor. He divorced a second time, and married his third wife Harriet Greene Bassett in 1965. In 1972 he joined the University of Texas Medical Branch at Galveston, and was named the head of the Division of Earth and Planetary Sciences of the Marine Biomedical Institute. During his career he published over 340 scientific papers. He served as president of the American Geophysical Union and the Seismological Society of America. He led over 50 oceanic expeditions. He made many contributions to oceanography, including the discovery of the SOFAR Channel, the invention of the sofar bomb, and did much fundamental work on plate tectonics. While he was working on SOFAR, Ewing engaged in deep water photography, partly as a hobby and partly to help the government identify lost ships destroyed by U-boats. He was the chief scientist on board the Glomar Challenger. He originated Project Mogul, an early program to detect Soviet nuclear weapons tests. Ewing suffered a fatal stroke in 1974 in Galveston, Texas. Geophysics Laboratory at the University of Texas Medical Branch Marine Science Institute was renamed Maurice Ewing Hall. The Maurice Ewing Medals of the Society of Exploration Geophysicists and American Geophysical Union were named after him. The lunar wrinkle ridge Dorsa Ewing was named after him. ^ a b c Bullard, E. (1975). "William Maurice Ewing 12 May 1906 -- 4 May 1974". Biographical Memoirs of Fellows of the Royal Society. 21: 268–311. doi:10.1098/rsbm.1975.0007. ^ Drake, C. L. (1974). "Maurice Ewing". Physics Today. 27 (7): 59. Bibcode:1974PhT....27g..59D. doi:10.1063/1.3128712. ^ Benioff, H. (1951). "Sound Waves in the Atmosphere Generated by a Small Earthquake". Proceedings of the National Academy of Sciences. 37 (9): 600–603. Bibcode:1951PNAS...37..600B. doi:10.1073/pnas.37.9.600. PMC 1063427. PMID 16589019. ^ Oliver, J. (1958). "Seismic Surface Waves at Palisades from Explosions in Nevada and the Marshall Islands". Proceedings of the National Academy of Sciences. 44 (8): 780–785. Bibcode:1958PNAS...44..780O. doi:10.1073/pnas.44.8.780. PMC 534559. PMID 16590271. ^ Ewing, M. (1959). "Significance of the Worzel Deep Sea Ash". Proceedings of the National Academy of Sciences. 45 (3): 355–361. Bibcode:1959PNAS...45..355E. doi:10.1073/pnas.45.3.355. PMC 222565. PMID 16590390. ^ Onofrio, Jan (2001-01-01). Texas Biographical Dictionary. Somerset Publishers, Inc. ISBN 9780403099924. ^ "Maurice Ewing, Earth Scientist, Dies". The New York Times. 1974-05-05. ISSN 0362-4331. Retrieved 2018-12-29. ^ "Ewing, (William) Maurice." Current Biography 1953. The H.W. Wilson Company. 1954. p.189.